I've heard about "magic thermal cooker" earlier this year but knowing that its a pricy item, I've decided to wait till GSS (Great Singapore Sale) to see if I can get a good deal. Well, its worth the wait. I went to Tangs (since I have a $10 voucher) with the intention of getting either an Endo or Tiger brand thermal cooker. To my dismay, a Tiger thermal cooker cost $299 AFTER DISCOUNT! Same goes for Zojirushi. 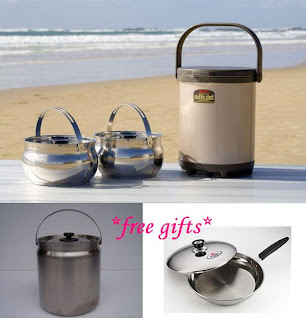 The price is only for a 1 pot cooker, I am looking for 2 pots cooker. On top of that the design is bulky, with the handle sticking out. It will occupy more space in my tight kitchen counter plus the handle will create some kind of hindrance to me (I'm no lady in any ways). I was very interested in Endo and La Gourmet as their price is slightly over a hundred for a 2-pots cooker. Was very curious about the price, asked the sales lady and was told that even though the brand is Japan & Germany, it is manufactured in Malaysia. She then recommends me Thermal Cookware, Shuttle Chef. The price is a hefty SGD299 after discount, usual price is SGD400+. I decided to part with my cash *painfully* and purchase this coz its compact thus does not take up alot of space, it does not have ugly "ears" sticking out at the side and most important it has 2 pots! Of course the freebies of x1 6litre pot and the frying pan of XXcm (no idea how big it is) makes me veered towards "go ahead and buy". Yesterday night I tried out with water, put the 2 pots of water on the stove for about 10mins n then put them into the container. This morning when I open it, the water are still hot, this makes me very eager to try out with the soup. Now that it passes the "keep warm" test, will it pass the "cooking" and "tasty" test? We shall see about it.